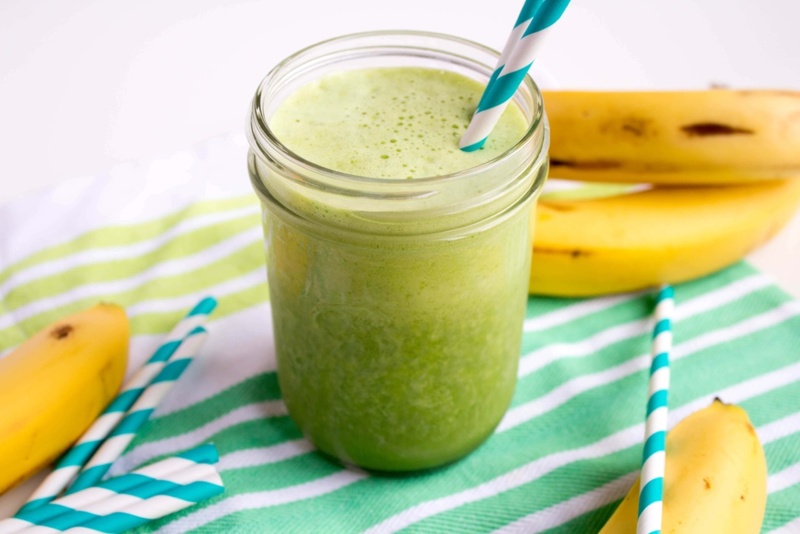 I realize this Banana Spinach Smoothie sounds weird, but give it a try! Looking to get in some greens but don’t feel like eating a huge salad? Want to get your kids to eat more veggies? 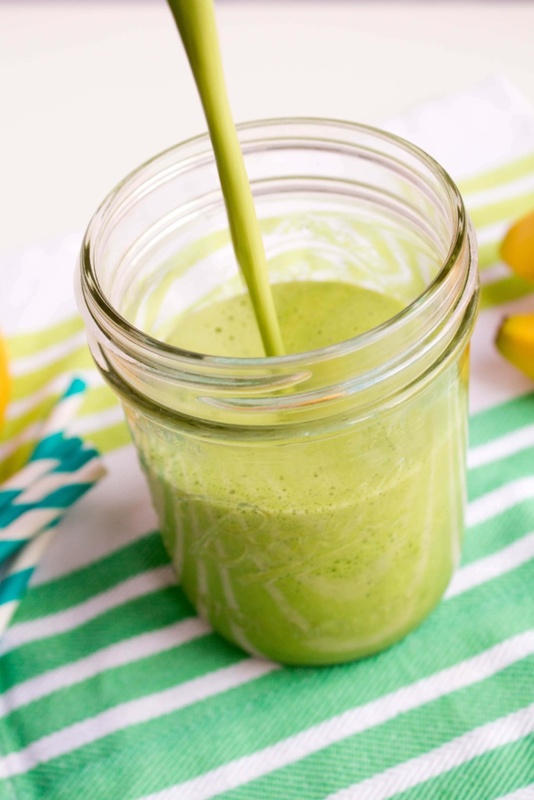 Whatever the reason, this leafy green packed smoothie is your new best friend. The banana makes it nice and sweet, and you won’t taste the spinach. This recipe is crazy easy, too. Only 3 ingredients (not including ice), and you just toss everything into the blender and enjoy! For more fruit, try berries – they go well here, too. For extra staying power from healthy fat, try tossing in a tablespoon of nut butter, flaxseed, or chia seeds. Or – did you know that avocado is delicious in smoothies? It makes them nice and creamy! Let me know what your favorite combinations are – or stick with the basic recipe, below! 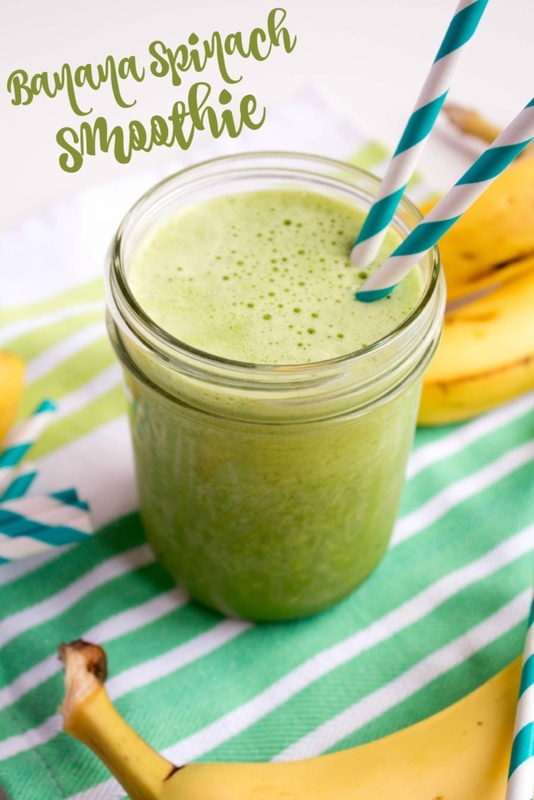 This delicious banana spinach smoothie is the easiest and yummiest way to get your veggies - you can't taste the spinach! Toss everything in a blender with a few ice cubes. Such a great way to sneak in some greens. Let me know how you like it – and what variations of it you make! I drink it in the a.m….and it is a slow process….maybe in the smoothie it would go down faster and taste better. Just a thought. Absolutely! That would definitely make it tastier. I do that a lot with the Vega greens smoothie powder – have you tried it? Pretty tasty actually! Dear Anne! This is pretty amazing! but I must say that as a child my grandmother used to give us some kind of juice (wich i didnt like because it was too healthy ;) that contained fresh orange juice+spinach juice. It really doesn’t taste bad and I appreciated more these days. Very smart grandma! I’d highly recommend you add a source of vitamin C to the spinach whenever raw spinach is involved in any dish or smoothie. Not only does the combination taste great, but the vitamin C helps unlock the calcium in spinach and makes it easier for your body to absorb. The same effect can be achieved by slightly cooking the spinach. Without cooking it or mixing it in with Vitamin C, much of the calcium passes through the gut without getting absorbed. Just read your post! Ha ha! The reason your smoothies combining spinach and strawberries is brown, is because the combination of the colors green and red makes brown! Still a great smoothies, I tried it and loved it! Thank u! Yum! Thanks so much for this recipe. I am in the first trimester of a twin pregnancy and having a really hard time eating due to queasiness. Last week I discovered I could stomach smoothies with bananas, milk, and vanilla whey protein to up my protein intake, but I wasn’t getting enough vegetables. I tried throwing in a couple handfuls spinach in the smoothie and I can hardly taste it at all. Now I can get protein AND veggies in a form I can handle eating – thanks! Yay I’m so happy to hear that! Hi Anne! These recipes look wonderful, and I’m so excited to try some of them. I noticed, however, that you use dairy in your spinach smoothie. I’ve always been told that its not good to combine dark leafy greens (spinach, kale, etc) with dairy because the dark greens interfere with your body’s ability to absorb the calcium in the dairy. As a general rule, I always use non-dairy milk when I make green smoothies. Have you ever thought about doing this? Awesome :) Thanks for the tip! Omg! Just tried this and it is fabulous! I had it with almond milk. Absolutely delicious!!! Trying this with orange juice was delicious! I added some flax seeds and protein powder to help me start my day and it really was divine. Thanks for sharing! I wonder what this would taste like if I use Almond milk and added some hemp seeds . Thanks for the recipe, I was trying to ascertain if spinach can be combined with bananas and voila . I’m adding your Facebook page to my massive vegan/vegetarian fb list . I’m not sure about the hemp seeds, but it would definitely work with almond milk! Enjoy! If Usain Bolt was raised on it, it must be good. :) Enjoy the other suggestions, too – glad the hemp seeds worked! Spinach can be combined with most other fruits and veggies. Try fresh pineapple or sweet apples. Delicious. You could also use kale in most smoothies. Not sure about the oranges – maybe the juice from 1 orange and just add more ice? Any % milk will work. And I would use fresh baby spinach, not frozen! Enjoy! Exactly what I was looking for to test my new Nutri Bullet. Delish! Thanks so much. Cheers! Funny how I found your website. Just went to look in the fridge, found the banana / spinach smoothie the wifey made before she left for college and its tastes like HEAVEN (Little chilled as well)! What are the long term benefits of just a spinach / banana smoothie perhaps for a period of 90 days? Just using these two ingredients in particular. The good thing about Spinach is that it does not overpower other ingredients like Kale can. I have tried the Spinach, Banana (frozen to make it super cold) with regular milk, with almond milk which gives it a nice nutty flavor and with orange juice. I have mixed in peaches, pineapple with OJ and water. I have used frozen mango, with almond milk and put some cardamom (a spice) in it. The cardamom enhanced the taste even more. I have added avocado to the spinach, banana and milk. The possibilities are endless. The thing about making smoothies is that you can experiment with whatever you have in hand that would pair well together. It’s awesome! I chucked in a few frozen berries and it was great for adding a bit of bite! I let myself go with spinach so it was a bit bitter but still good and very healthy. Thanks! Hey I was just wondering if you guys ever tried it with soy milk? I am just recently enjoying soy milk and I’m starting to love the taste! Wondering what experiences you’ve had with this..? Haha sorry only just read your post clau, sorry! But have you tried it with regular soy milk aswel? I don’t usually drink soy milk but I’m sure it would be good! Hi I have been told that when drinking dairy that the calcium in the milk is so acidic that to balance the ph levels out bodies will search it’s own reserves for calcium which it withdraws from our bones. Therefor dairy is not good for us. I use almond milk for everything. You don’t have to agree but this is what I have read in non fiction books so I thought I would share it. What if I used almond milk instead of skim? Think it’d taste good? I think I’ll try it! Whoever above asked if it was good with soy milk, it definitely is! That’s how I made mine and it tasted great. Just made this for my partner and I and wow! This is amazing. Didn’t use much milk! I’m going explore much more now. I used the spinach( lots of it ) coconut milk, a touch of local honey, some chia seeds and a whole banan! This was yummy! I make this all the time, with a frozen pre-sliced banana, vanilla lite soy milk and a large helping of spinach. Perfect breakfast! I’ve just tried and it’s amazing. I’ve always loved spinach and all things green! I’ve just had an oral surgery and not been able to eat solids and came across your recipe. Love it love it love it! I’m thinking of using avocado instead of banana next time. I tried this today and it was delicious! Thank you so much. Just what I needed this morning. About to start a 16 hr day with a cold and this tastes great and makes me feel good to be giving greens to my body. Tastes like a milkshake! 1 measuring cup’s worth (8 oz or about 235 ml). I make a yummy green smoothie using 1 frozen banana, 200g baby spinach, 250ml apple juice, juice of 1 lime and a sprinkle of chia seeds and all in the blender. Its so good. What about using watercress in place of or w/ the spinach and banana? You could try adding it! Let us know how it is! I used skim milk, watercress, banana and a few frozen strawberries. Very good. I think I’ll try almond milk and or Greek yogurt. This is great! I throw in a little bit of powdered peanut butter (PB2) – yummy!! I’m doing a handful of mixed spinach and watercress, 6-8 oz of almond milk, 1/4 cup frozen wild blueberries, 1 banana, 4 chunks of fresh pineapple and 2 tbsp of almond slices or pecans. Taste great. I have been having at least one a day. My energy has gotten better and have lost 9 lbs in 2 weeks. Would adding chocolate syrup and/or peanut butter work? Girl! I was just laying here thinking that I ran out of fruit for a spinach smoothie, then I remembered that I have bananas. So, I thought “hmmmmm, that could be good or VERY nasty.” I googled and found your thread. Hahahaha…thanks for posting. I will go give it a try ! My 9 year old son took it and drank it! I had to make a 2nd one for me ;) You’re the best! I love this but I make one with frozen berries (raspberries, strawberries, blueberries), almond milk instead of dairy milk and I add flaxseed. It really keeps me full and gets fruits and veggies in me! Aaaaah this what I was getting at. I was going to ask if I could use wheat germ but I see you commented that you use flaxseed. I have some so I’m going to whip some up right now lol Thank you! Would it hurt to use frozen spinach instead of fresh? It might be a little too watery but you could try it! I have fresh baby spinach and 2 bananas that are very riped. Instead of wasting them, I figured I would make a smoothie. I googled these two ingredients and your receipt came up. I’m looking forward to trying it out!! This was my first homemade green smoothie and it was absolutely amazing! However instead of half a banana I used a whole and i used orange juice instead of milk because we didn’t have skim. I recently got into green smoothies after trying paneras b-green power smoothie. Im super excited to try more green smoothie recipes like this. Thank you! I tried to make this and i don’t think It tasted right, I’m not sure what I did though. I just tried this with 2 c. of spinach, a whole banana, a cup of 2% (didn’t have skim), and I added a tablespoon of sunflower seeds, with a few ice cubes. It’s really tasty! I was going to do two handfuls of spinach, but it would have been way more than 2 cups. On the other hand, I can’t taste the spinach, so maybe next time I will do more. (because I LIKE spinach!) I might also add blueberries next time, but I don’t want to change the taste too much, so how many do you think would be good? I have also done just milk, banana, and a cup of baby carrots. Also very tasty. Maybe I should add the carrots to this!!!!! Wow, carrots AND spinach! Blueberries would be good! Maybe 1/4 cup? I’ll give it a try in the next few days and let you know. Thanks! I will try it in the next day or two and let you know. Thanks! Anyway it was good but a bit bland so I topped it off with nutmeg which helped. Will try other things like cinnamon and maybe just veggies without fruit with some creole spice or something. I think I just have to get used to drinking green stuff that tastes like fruit. My mind doesn’t bend that way right now lol! Hi, finally tried the smoothie with 1/4 c. blueberries. Didn’t really like it, changed the taste too much. So I stuck in a few baby carrots and sunflower seeds again, and that was much better. Thanks again. I eat no greens so I’m looking for a cheat so to speak and came across this recipe! I’m gonna give it a go but do you have any other suggestions that will help me as I hate veggies? Try roasting veggies – makes them much tastier! I tried this today and it is delicious! I substituted Unsweetened Flax Milk. Thank you for the recipe! 1 cup of milk has about 8 grams, so around that! Do you have to use skim milk or can it be whole milk? Any kind of milk works! Maybe add a teaspoon of peanut butter in there also. Tried this yesterday, and must say it taste fantastic! Knowing that your getting vital nutrients in just one smoothie is a great feeling! Good way to start your day and I couldn’t recommend it more! Am glad I have come across this website. Now it’s time to experiment with some more fruits and vegetables! Can I use frozen spinach instead? How many cubes? I’ve been meaning to do a green smoothie and needed some inspiration. Frozen should work! Maybe 1/4 cup or 1/8 cup worth? I’m not really sure as I haven’t tried it with frozen! I know I’m late to the party but wow this drink is amazing thank you. These recipes seem to all say baby spinach, regular spinach (where I live anyways) is much cheaper- probably more nutricious too judging by color- is no good? Sure, feel free to use regular spinach! You just might taste it a little more. Thanks for reply Anne. Seems fine to me, I think spinach has very little flavor to it- banana overpowers. Hello everyone and Happy 2016. I need guidance. I only have a blender and do not know where to begin or what to buy. 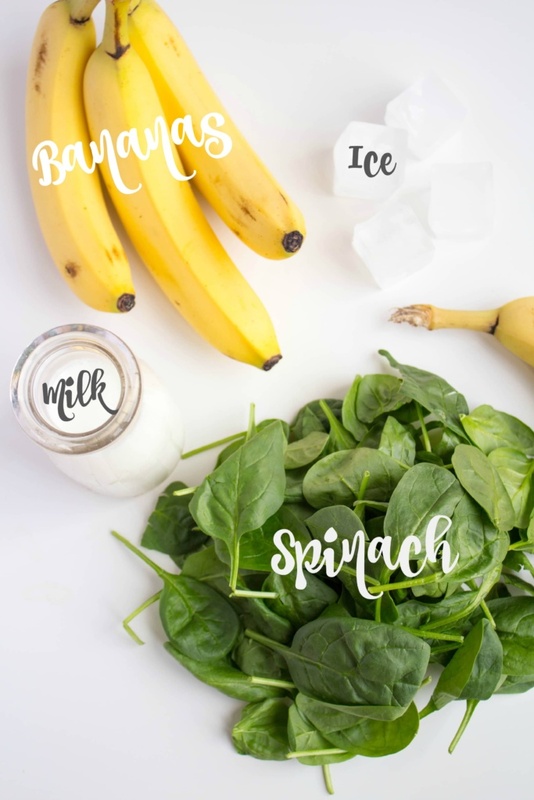 Since I have never created a smoothie and really want to get into these and eat better,what other than spinach, bananas, almond milk,what else can I use and buy? I am looking for the ingredients that will allow be to change up everyday with out having to but the whole produce department. It sounds like freezing bananas will help save and keep them from going brown so fast. Help what do I buy first so I do not have a bad experience? Can you be more specific on the milk content? As stated in the recipe, it’s 1 cup. Regarding the kind, I’ve made this recipe using whole milk, 2% milk, and almond milk, and all are great. Enjoy! Wasn’t sure at first as thought it might be “bitty” but it was perfectly smooth…first, I put the milk in, followed by a huge amount of spinach and blended it for a minute..then I added 2 bananas and finished off for 30 seconds…the result is delicious, no taste of spinach and the colour is healthy looking..!!! Deffo a good way to kick start your morning..!!! Omg. This is the best thing ever. I have never done anything like this and was thinking it would taste horrible but it tastes so good. I do a similar smoothie, but I add vanilla whey protein powder, raw cacao, date sugar and do a half and half mixture of milk and water. Another suggestion would be to add avocado and skip the ice, it gives it more of a milkshake texture. My first green smoothie and it’s a hit. I did add 2 handfuls of frozen blueberries. Really a great starter recipe, thank you Anne. Sounds like an interesting variation – thanks for sharing! Really smooth and creamy, delicous! I make these every morning for my mom and I. I didn’t get it from your recipe though I made it up and I love it. I made this with almond milk and a teaspoon of peanut butter! It was great!! I throw in some Anaheim pepper for flavor and zing. So I usually use water instead of milk. For example, this morning I juiced, 1.5 handful of spinach, 1 carrot, 1 banana, 2 tablespoons of flax seed, 1 teaspoon turmeric and water. Definitely didn’t taste the spinach or carrot. I do different variations but usually my base veggies stay the same: baby kale and baby spinach. I alternate my fruits so that I don’t get bored with it since I usually juice for breakfast! Banana is a perfect ingredient. It has a unique flavor and is extremely healthy as it is rich in nutrients like iron and potassium. This smoothie will be very helpful for busy bees like me. Thank you for sharing. I was hesitant to add the spinach but I did it and added a teaspoon of peanut butter and chia seeds and wow, it was the tastiest smoothie ever. It was green but tasted just like a banana smoothie. Thank you! Love this recipe ! This morning I added pineapple, strawberries, flax and hemp seeds! So good!!! Yay, glad you love it!